There are no doubt endless resolutions, predictions and forecasts galore as the New Year approaches, and I have one of my own. With the seismic shift in power at 1600 Pennsylvania Avenue, investors have wasted no time placing their bets on the front-running investment themes. Broad deregulation, lower corporate and personal income taxes, immigration reform, massive infrastructure spending and repatriation of capital lead the hot list of what will be front-and-center agenda items in the first 100 days. For income investors, such a bullish backdrop for the economy in general will very likely lead to gradually higher interest rates and a furthering of the rally in the dollar that are very real headwinds for the great majority of high-yielding asset classes. What’s more, earnings comparisons for the S&P 500 will be more pronounced as the market comes out of an earnings recession, with some market economists calling for a rise of 20% in S&P earnings if the corporate tax rate takes effect in 2017. It is clear that the financial sector will benefit from further rate hikes by the Fed, increased lending activity, stock buybacks and the raising of dividends based on stronger revenue and earnings. The problem for most investors today is that dividend yields for most common stocks fall well short of keeping up with the cost of living. As a result, investors end up selling shares that hopefully have appreciated to compensate for the lower income derived from stocks in favored sectors. 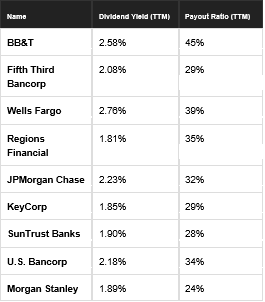 Below is a list of American banks and their respective current dividend yields as of last Friday. I don’t know anyone who can live on a 1.88% return on their investment capital. Indeed, $1 million at that rate generates an annual income of $18,800. Even $3 million of capital wouldn’t generate $60,000 per year. So how does one who depends on dividend income to stay ahead of household expenses, taxes and inflation play the hot financial sector when rates are moving higher? By being long in shares of private equity partnerships. This is the quintessential “have your cake and eat it too” scenario for what 2017 has to hold for income investing where institutional money is flowing. As a subset of the financial sector, private equity stocks were crushed as asset values fell, initial public offering (IPO) markets were shut and spreads on high-yield bonds surged following a post-crisis tightening of credit. But since late 2015, these difficult conditions have improved. And private equity firms may now be in the best position to capitalize on the attractive investments they’ve acquired during the tough times when valuations were deeply discounted. In addition, private equity companies are not registered investment companies. In fact, they don’t want to be because of the requirement that virtually all income has to be paid out to shareholders. Instead, they are formed as partnerships, and as partnerships, they avoid most corporate income taxes earned from fund fees and incentives. Not all of their income qualifies for favorable partnership treatment, but they have a way around that, too. Income that isn’t qualified gets sent to a taxable subsidiary, gets taxed and then is paid out to the parent company. Through the magic of the tax code, these distributions are qualified, and thus, both firms avoid corporate taxes on a majority of their income. Thus, in most cases, much of the income flows straight through to shareholders, who pay taxes at the individual level. The only tangible difference is the tax form — private equity shareholders receive a K-1 form for being a member of a partnership. As a result, a good portion of income received is tax-advantaged, similar to that of energy Master Limited Partnerships (MLPs). As partnerships, quarterly distributions ebb and flow with quarterly profits. In an environment where increased deal flow, initial public offerings and merger activity afford higher fees and exits of private portfolio holdings, higher profits result in higher payouts. We are entering an investing landscape that should provide several catalysts for private equity firms that, in turn, should reward shareholders with rising income and rising stock prices. 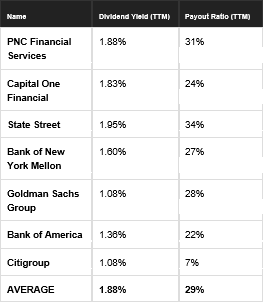 The six private equity companies that I follow boast an average distribution yield of 7.5%, or four times that of the 1.88% blended yield of the banks noted. Now that is a difference maker and one that income investors seeking to outgun the Fed, the inflation genie, the taxman and the broad market indexes should take to heart. The best way to know which private equity stocks to buy, how much to buy and when to sell in 2017 is to become a subscriber to Cash Machine, a serious high-yield advisory investment newsletter tailored for investors who are serious about their current and future income. As the New Year presents a set of fresh fluid and dynamic circumstances, put an advisor in your corner who has more than 30 years of professional investment experience to help guide your income portfolio to its maximum potential. I use strategies that range from conservative to aggressive, letting you match your risk profile. Make teaming up with me a New Year’s resolution that rivals any promise to lose weight. Take the initiative for 2017 and pump up your income beginning today to get your income-focused capital to perform like a champion. In case you missed it, I encourage you to read my e-letter from last week about how trends in global events and currency markets affect investors. 2016 was a most unpredictable year for financial experts, full of ups and downs. Doug Fabian reviews the year past and what to expect in the new one.